Democracy Works’ TurboVote is an easy to use tool that anyone can use to sign up to receive election reminders, get registered to vote, and apply for an absentee ballot. Since registration deadlines vary, registering on National Voter Registration Day – which is Tuesday, September 25th – will ensure you register in time to vote in this election. Each state has different ways to keep voter registration lists up-to-date, so it’s a good idea to use ALL IN to Vote’s tool to confirm your registration ahead of time and ensure your information is accurate. Be sure to check that your name, address, and party affiliation information are up-to-date; your registration wasn’t mistakenly removed by your state from the list of eligible voters; you are able to vote; and you’re voting at the correct polling place. Know who and what you’re voting for by researching the names and ballot measures on your ballot before you vote. Tools like BallotReady allow you to explore your entire ballot. Not only can you see every candidate that is running for office at the federal, state, and local level, but you can also find information on their background, stances, and endorsements. If you plan to vote in-person, you’ll need to know where to go! Democracy Works has you covered with their Get to the Polls tool. While you’re there, make sure to check the hours of when your polling location is open. 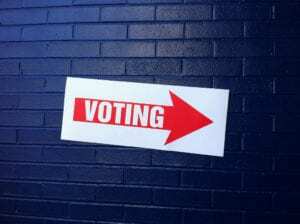 Step 5: Vote – and Celebrate! Lastly – and most importantly – make a plan to vote with the ALL IN to Vote tool. Whether you’re voting in-person on election day, voting early, or voting by mail, it’s best to know before you go. Be sure to check the ID requirements in your state. While you’re at it, look-up to see whether there will be a #VoteTogether party at your polling location! Democracy goes best with a side of free food and music! With these five steps, everyone can ensure they are ready to cast their ballot this November. If you have any questions about registering to vote, finding your polling place, or have other questions, you can use the Campus Vote Project’s State Voter Guides.